It has been a long, long time since I heard this album, but for Xmas I just got off a friend the remastered cd, so now I have refreshed my memory enough to give a review. When it was released, this was my least favourite 10cc album. There were some moments of brilliance, but also moments of inconsistency, I felt. Now, on hearing it again, I think the brilliance has won out, and I love the whole album! The opening title track is an instrumental and is an excellent way to start. Superb guitar and gizmo work, and the track has a feeling of spaciousness to it that is hard to describe. For some reason, it calls to my mind an airport lounge! 'Lazy Ways' was always one of my favourite tracks. A superb, mid paced song with nice vocals from Eric and strong acoustic and electric guitar work. 'I Wanna Rule The World' was one of those tracks I could never get into, but now I appreciate it more. 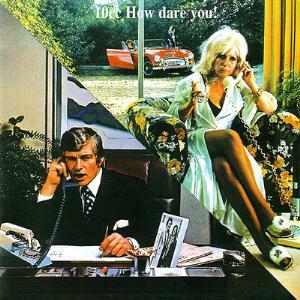 Typical 10cc this: Lots of different voices, plenty of humour and interesting moments of melody. Has to be heard a few times to be really appreciated though. 'I'm Mandy, Fly Me' was a hit at the time, and is a great song. More great tempo changes, some nice slow bits, great acoustic guitar in the middle - what more could you ask for? And on top of it all we have Eric's wonderful vocals. it tells a great story too, but I won't spoil that for you. As usual, great harmonies pervade the whole piece. 'Iceberg' was another of those tracks I wasn't keen on originally, but now I enjoy it a lot more. This one is sung by Graham and a good job he does too. The track sounds disjointed, but actually gels together well. The song has an almost jazzy feel to it but never loses its sense of structure or melody, nice guitar from Eric here too. 'Art For Art's Sake' was another hit in the charts. Vocals are supplied by Lol this time and the usual biting satire is here in full force. Eric supplies a nice guitar solo at the end too. 'Rock 'N' Roll Lullaby' was another of my favourites, and still is. The tempo does indeed bring to mind a lullaby, the melody is catchy, and Kevin sings this one superbly. Another classic 10cc line here: 'It's daybreak in the land of nod, so get to sleep you little sod.' Wonderful stuff! And the harmonies here are amongst the best on the album, with the ending being particularly effective. A great track. 'Head Room' is also very good. The guitar work here has an almost countryish feel to it, but that doesn't detract from the interesting lyrics and laid back verse and chorus. Finally comes the mini epic 'Don't Hang Up' with a strong performance from Kevin on vocals. This is a slower song, and has the most wonderful melody. The middle bit has an almost spanish feel to it, with what sounds like castanets being played in the instrumental section. More great harmonies lead back to the original melody. Another great line here: 'When the barman said whatcha drinking, I said marriage on the rocks.' Sheer brilliance! The very ending, as Kevin sings 'don't say...' and gets cut off, leaving the dial tone to fade slowly away, is extremely effective. On this remaster there is a bonus track called 'You've Got To Get It While You Can' which I think was the b - side of 'Art For Art's Sake. (Which I own.) There is a line sung in this that the band use again on the Bloody Tourists album, on the track 'The Anonymous Alchoholic'. Namely: 'Everybody's having fun, so why be the one whose out in the cold.' The track is pleasant if none essential and brings a great album to a satisfactory close. Another four star effort.